The Global Volcanism Program has no activity reports for Fisher. The Global Volcanism Program has no Weekly Reports available for Fisher. The Global Volcanism Program has no Bulletin Reports available for Fisher. The 11 x 18 km Fisher caldera on western Unimak Island NE of Westdahl volcano is one of the largest calderas in the Aleutian arc. The caldera, which is elongated in a NE direction, formed around 9400 years ago, accompanied by emission of large-volume, mobile pyroclastic flows that reached the Bering Sea and the Pacific Ocean. Two satellitic cones are located below the north rim, NE of its 1112-m high point at Eickelberg Peak, which rises more than 900 m above three lakes on the caldera floor, one of which drains through a notch in the southern caldera rim. A large composite cone, Mount Finch, is found at the center of the caldera, which also contains a small breached cinder cone. Historical eruptions have occurred in the 18th and 19th centuries. 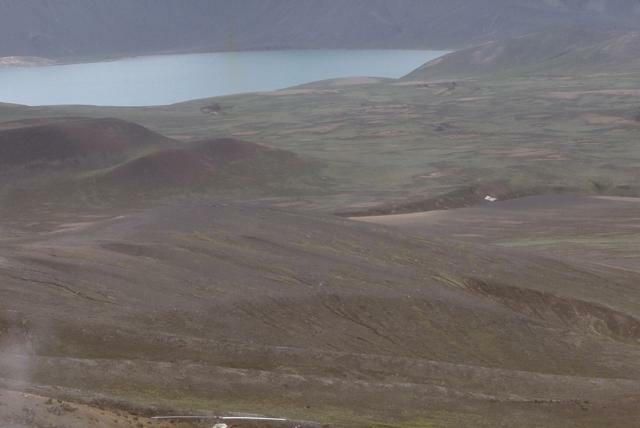 Low-temperature fumaroles are located at the western flank of Mount Finch, and Turquoise Lake, at the base of the cone, emits hydrogen sulfide gas. Bindeman I A, Fournelle J H, Valley J W, 2001. Low-delta 18O tephra from a compositionally zoned magma body: Fisher caldera, Unimak Island, Aleutians. J. Volcanol. Geotherm. Res., 111: 35-53. Gardner J E, Burgisser A, Stelling P, 2007. Eruption and deposition of the Fisher Tuff (Alaska): evidence for the evolution of pyroclastic flows. J Geol, 115: 417-435. Miller T P, Smith R L, 1977. Spectacular mobility of ash flows around Aniakchak and Fisher Calderas, Alaska. Geology, 5: 173-176. Stelling P, Gardner J E, Beget J, 2005. Eruptive history of Fisher caldera, Alaska, USA. J. Volcanol. Geotherm. Res., 139: 163-183. Remarks: Fisher Caldera has been subsiding persistently. Velocity maps from (a) PSI and (b) SBAS processing, respectively. From: Gong et al. 2015. Reference List: Lu and Dzurisin 2014; Mann and Freymueller 2003; Gong et al. 2015. There is no Emissions History data available for Fisher. This 1974 view shows part of the interior of Fisher caldera on Unimak Island in the eastern Aleutian Islands. Fisher is an 11 x 18 km caldera that formed about 9100 years ago during the eruption of compositionally zoned ash flows that overtopped topographic barriers more than 500 m in elevation. The caldera contains two large lakes and a smaller lake that drains through a notch in the south caldera rim. There has been one poorly documented historical eruption from Fisher in 1826. Photo by Tom Miller, 1974 (U.S. Geological Survey). Large Eruptions of Fisher Information about large Quaternary eruptions (VEI >= 4) is cataloged in the Large Magnitude Explosive Volcanic Eruptions (LaMEVE) database of the Volcano Global Risk Identification and Analysis Project (VOGRIPA).